I’m introducing a new article series called Future America. This series will talk about the degenerating culture and standards, and the impact this degeneration will have on you and your planning. It won’t be all grim, though, some of it will be fun, like this one. 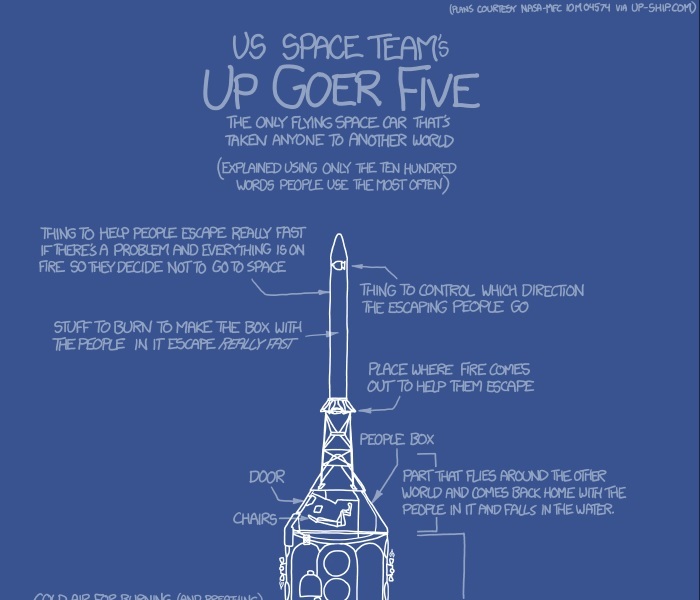 Today, I ran across this xkcd drawing showing the Saturn V, explained in terms which only use the first thousand most common words. Apparently, the word thousand isn’t one of them. If you’ve ever tried to explain anything to a modern American, and the topic didn’t involve the latest Honey Boo Boo sportsgame or iLeash, you’ll appreciate this as much as I do. He did have a nice iPhone, though. 6 Comments on "Future America: Up Goer Five"
I saw a guy once put his rifle barrel in a vice with unpadded jaws…..
Hopefully he wasn’t a gunsmith and it was his own rifle. I can understand not knowing any better with your own stuff, but if I am going to pay someone to do something, I want them to be better at it than me. Couple of weeks ago I caught the furnace guy attempting to turn my gas on/off with the use of ChannelLock pliers. After a lecture, I gave gifted him the proper tool for the job. Don’t be blowin’ up my house. Speaking of using the right tool for the job… I’m currently between houses, so I don’t have all of my tools and I’m forced into making-do and finding work-arounds. Sometimes this leads to new discoveries, however. Screen-cleaning cloths (the little black ones) are thin enough, grippy enough, and strong enough that I was able to finally get a flash-hider unstuck from the front of my 10/22 with an adjustable wrench without marking the metal up and ruining it. About two cars ago, I decided to change the oil myself to save a few bucks. The last “professional” to do the job must not have had the proper size air wrench fitting, because the plug was rounded off. Using a medium size vise grip and a long pipe as an extender, I carefully got it loose. At least the plug wasn’t cross threaded. While the oil was draining, I filed a couple of flats onto the plug so I could use it until I could get a replacement. Never went back to that place again. I wish I had taken pictures of what we did a couple of months ago to get the oil plug out of a 6510 ditch witch we bought at an auction. Same thing, the plug was almost rounded completely off; the oil looked like it had missed more than a few changes (the oil filter was rusted in place also). Filed the plug flats down in-place, forced a smaller metric 6-sided impact socket onto it, plugged that into a flex head ratchet, kept that forced into place with a 2×4 against the frame, and used a six-foot cheater pipe to break it free. Turned out the gasket was missing and some moron proved his manhood by tightening it until the dripping stopped. Reshaped the plug with a file, 3D-printed a new gasket, and it is fine. It was the only one I could find that can be operated at any angle, and can take a large amount of lateral pressure against the head to hold the socket against the plug. When it broke free, I was sure something had snapped. The engine purrs like a kitten now.